"Beef jerky" redirects here. For other uses, see Beef jerky (disambiguation). Jerky is lean meat that has been trimmed of fat, cut into strips, and then dried to prevent spoilage. Normally, this drying includes the addition of salt, to prevent bacteria from developing on the meat before sufficient moisture has been removed. The word "jerky" is derived from the Quechua word ch'arki which means "dried, salted meat". All that is needed to produce basic "jerky" is a low-temperature drying method, and salt to inhibit bacterial growth. 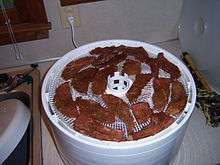 Modern manufactured jerky is normally marinated in a seasoned spice rub or liquid, and dried, dehydrated or smoked with low heat (usually under 70 °C/160 °F). Some product manufacturers finely grind meat, mix in seasonings, and press the meat-paste into flat shapes prior to drying. The resulting jerky from the above methods would be a salty and/or savory snack. However, often a sweet or semi-sweet recipe is used, with sugar being a major ingredient (in contrast to biltong which is a dried meat product that utilizes the acid in vinegar rather than salt to inhibit bacterial growth when drying the meat). Jerky is ready-to-eat and needs no additional preparation. It can be stored for months without refrigeration. When the protein to moisture content ratio is correct, the resulting meat is cured, or preserved. There are many products in the marketplace which are sold as jerky which consist of highly processed, chopped and formed meat, rather than traditional sliced, whole-muscle meat. These products may contain more fat, but moisture content, like the whole-muscle product, must meet a 0.75 to 1 moisture to protein ratio in the US. Chemical preservatives can be used to prevent oxidative spoilage, but the moisture to protein ratio prevents microbial spoilage by low water activity. Many jerky products are very high in sugar and are therefore very sweet, unlike biltong, which rarely contains added sugars. A typical 30 g portion of fresh jerky contains 10–15 g of protein, 1 g of fat, and 0–3 g of carbohydrates, although some beef jerky can have more than 65% of protein content. Since traditional jerky recipes use a basic salt cure, sodium can be a concern for some people. A 30 g serving of jerky could contain more than 600 mg of sodium, which would be about 30% of the recommended USRDA. 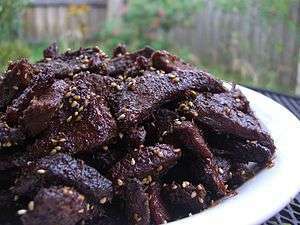 Chinese bakkwa, which is commonly mistaken for jerky, is actually a barbecued, rather than dried, product. Any particular preparation or recipe for jerky typically uses only one type of meat. 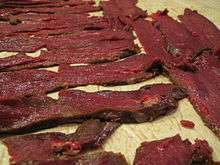 Around the world, meat from domestic and wild animals is used to make jerky. Meats from domestic animals include beef, pork, goat and mutton or lamb. Wild animals including deer, kudu, springbok, kangaroo, and bison are also used. Recently, other animals such as turkey, ostrich, salmon, alligator, crocodile, tuna, emu, horse, and camel, earthworm have also been used. Most of the fat must be trimmed off prior to drying the meat, as fat does not dry, thus creating the potential for spoilage as the fat becomes rancid (modern vacuum packing and chemical preservatives have served to help prevent these risks). The meat must be dried quickly, to limit bacterial growth during the critical period where the meat is not yet dry. To do this, the meat is thinly sliced, or pressed thinly, in the case of ground meat. The strips of meat are dried at low temperatures, to avoid cooking it, or overdrying it to the point where it is brittle. In present-day factories, large jerky ovens are made of insulated panels. Inside these low-temperature drying ovens are many heater elements and fans. The ovens have exhaust ports to remove the moisture-laden air. The combination of fast-moving air and low heat dries the meat to the desired moisture content within a few hours. The raw, marinated jerky strips are placed on racks of nylon-coated metal screens which have been sprayed with a light vegetable oil to allow the meat to be removed easily. The screen trays are placed closely in layers on rolling carts which are then put in the drying oven. Some additional form of chemical preservative, such as sodium nitrite, is often used in conjunction with the historical salted drying procedure to prepare jerky. Smoking is the most traditional method, as it preserves, flavors, and dries the meat simultaneously. Salting is the most common method used today, as it both provides seasoning to improve the flavor as well as preserve the meat. While some methods involve applying the seasonings with a marinade, this can increase the drying time by adding moisture to the meat. Raw meat before dehydration into jerky. After the jerky is dried to the proper moisture content to prevent spoilage, it is cooled, then packaged in (often resealable) plastic bags, either nitrogen gas flushed or vacuumed packed. To prevent the oxidation of the fat, the sealed packages often contain small pouches of oxygen absorber. These small packets are filled with iron particles which react with oxygen, removing the oxygen from the sealed jerky package, and from the air that is introduced after the seal is broken (due to partial consumption). Because of the necessary low fat and moisture content, jerky is high in protein. A 30 g (about 1 oz) portion of lean meat, for example, contains about 7 g of protein. By removing 15 g of water from the meat, the protein ratio is doubled to nearly 15 g of protein per 30 g portion. In some low moisture varieties, a 30 g serving will contain 21 g of protein, and only one g of fat. This leads to the high price of such brands of jerky, as it takes 90 g of 99% lean meat to generate that 30 g serving. Unpackaged fresh jerky made from sliced, whole muscle meat has been available in specialty stores in Hong Kong at least since the 1970s. The products are purchased by kilograms, and customers choose from 10 to 20 types of meat used to make the product. Some are sold in strands instead of slices. Macau has opened numerous specialty shops also, many of which are franchise extensions of stores from Hong Kong. Compared to the sealed packaged versions, unpackaged jerky has a relatively short shelf life. This type of jerky has also become very popular in convenience stores in the USA. This product is called "slab" jerky and is usually marketed in plexiglass containers. Most nations have regulations pertaining to the production of dried meat products. There are strict requirements to ensure safe and wholesome production of jerky products. Factories are required to have inspectors and sanitation plans. In the United States, the U.S. Department of Agriculture (USDA) is responsible for that oversight. Many European Union countries presently prohibit the importation of meat products, including jerky, without additional and extensive customs documentation, and further inspections. 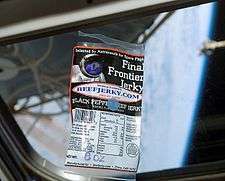 Final Frontier Jerky from BeefJerky.com floats aboard the International Space Station with Earth visible through the window. Traditional jerky, made from sliced, whole muscle meat, is readily available in the United States and Canada in varying meats, brands and qualities, both as packaged and unpackaged. These products are available in nearly every convenience store, gas station, supermarket, and variety shop in those countries, where there is a long history of jerky as a food of the pioneers. A similar, less expensive product is made with finely ground meat, mixed with flavors, then the mush is processed into thin dried strips. The finished item may be labeled as jerky, but with the qualifier "ground and formed". This product is widely available in general interest stores, such as supermarkets and convenience stores. Also popular is shredded dry jerky (meat floss) sold in containers resembling snuff or dip. Jerky made in the traditional style is also a ubiquitous staple of farmers' markets in rural areas all over North America. In addition to being quite common in the United States and Canada, jerky is also gaining popularity in supermarkets, convenience stores and online retailers. In Australia, New Zealand and the United Kingdom, jerky products are available and becoming more common. They are carried by some major supermarkets, and now also smaller stores. In China, in addition to the more traditional forms of jerky, there is also a similar product which is usually made from pork called pork chip. A similar product is quite popular in Rome, Italy, and its hinterland: it is called coppiette and was originally made with horse or donkey meat, but it is now generally made with pork. Coppiette are seasoned with red pepper and fennel seeds. Coppiette were usually eaten while drinking wine (mostly white) in Roman osterie. In Tamil Nadu, India the dish is known as uppu kandam which forms part of authentic non vegetarian cuisine. In Ethiopia, jerky is called qwant'a. In addition to salt, it is seasoned with black pepper and either berbere or awaze. A similar product, biltong, is common in South African cuisine; however, it differs very much in production process and taste. In Hausa cuisine, kilishi is a form of dried meat, similar to jerky, that is heavily spiced with peppers. Jerky (or products closely related to it) is commonly included in military field rations. It is particularly attractive to militaries because of its light weight, high level of nutrition, long shelf life and edibility without further preparation. Since 1996, jerky has been selected by astronauts as space food several times for space flight due to its light weight and high level of nutrition. ↑ "Globe trotting: Ecuador". Taipei Times. 15 July 2006. Retrieved 6 February 2015. ↑ "Feet in the Trough: Cured Meat". The Economist. 2006-12-19. Retrieved 2007-12-19. ↑ Richard J. Epley and Paul B. Addis. "Processing Meat in the Home" (PDF). Minnesota Extension Service. ↑ "Billy Franks Beef Jerky - Roast Beef and Mustard (40g)". MeatSnacker. Retrieved 30 March 2015. ↑ Delong, Deanna (1992). How to Dry Foods. Penguin Group. p. 79. ISBN 1-55788-050-6. ↑ "Crocodile Jerky Lemon Pepper". Beef Jerky Original. Retrieved 2016-06-18. ↑ "I'd Like to See a Menu, Please". NASA. 2004-05-13. Retrieved 2007-01-08. ↑ "Space Food". NASA. 2004-05-27. Archived from the original on 2004-11-03. Retrieved 2007-01-03.